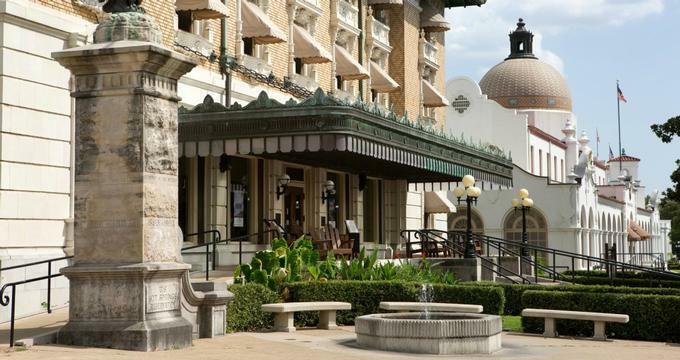 Hot Springs, AR is home to a National Park featuring Bathhouse Row, eight historic bathhouses and surrounding gardens along Central Avenue. The city is famous for its healing waters, now offered in luxury spas, but also for its great museums such as the Gangster Museum, galleries, inns, and amusement parks such as Funtrackers Family Park or Magic Cove. Just outside Hot Springs, Arkansas are several magnificent parks such as the Ouachita National Forest, where you can hike through dense groves of ancient trees. 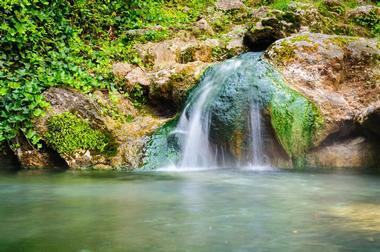 Hot Springs National Park has been valued for its beauty for many years. It was the first piece of land in the United States to be designated for preservation, with its “reservation” status predating even the national park system. Hot Springs National Park is the home of Hot Springs Mountain, which is part of the Ouachita Mountain chain. This mountain’s western slope is where visitors will find the park’s thermal springs, which give the park its name and are said to have healing properties. Hot Springs National Park runs directly through the city of Hot Springs, making its hiking trails and attractions very easily accessible. The Grand Promenade is a wide, half-mile long brick walkway that runs alongside Hot Springs’ Bathhouse Row and Central Avenue. This pedestrian-only path serves as a nice oasis from the noise of the city, as it is somewhat removed from the crowds of the main streets. Standing at a raised elevation, it gives its visitors a peek at the backs of the bathhouses on Bathhouse Row. While strolling along this promenade, you will find some of the cold and hot springs the city is so famous for. In 1982, it was deemed a National Recreation Trail, and several of the hiking trails that go through the national park begin along this pathway. The Ouachita National Forest stretches over 1.8 million acres between Arkansas and Oklahoma and is mostly located in the Ouachita Mountains. This is a multiple use, working forest with managed wood and timber harvesting, wilderness management, minerals leasing and spectacular recreation. You can enjoy driving through many paved scenic roads, kayaking and canoeing in one of many wild mountain rivers, hiking, biking, horseback riding, or off-road vehicle riding through many trails, some of which are easy and some of which are quite challenging. Nature lovers enjoy bird watching and wildlife spotting . One of the most popular trails is Horsethief Springs Trail, an 11-mile long trail that starts at Cedar Lake and loops across numerous streams and through magnificent forests with many different tree and plant species. The trail loops back taking you down the northern face of Winding Stair Mountain back to Cedar Lake. Once upon a time, though not so long ago (in the 20's, 30's, and 40's), Hot Springs was a hot place to visit, and not only because of the hot, healing mineral waters. Bootlegging, gambling, and other illicit pleasures readily available in Hot Springs attracted all kinds of visitors from all over the world, some of them of dubious reputation. The Gangster Museum of America offers a historically accurate and entertaining account of the interaction of some of the America’s most notorious criminals with the innocent, quaint population of the charming little town in the mountains of Arkansas. There are seven galleries with fascinating audiovisual presentations. You can try your hand in the antique casino or listen to the stories told by the local historian in the museum’s theater. 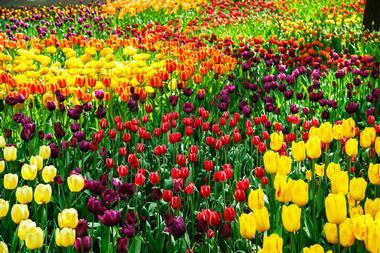 You will find that sometimes real life can be more interesting than movies or novels. Imagine holding a baby alligator in your hand, or feeding its 10-foot long mama from a stick! 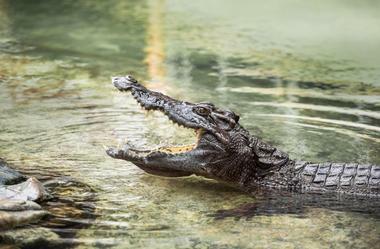 These are just some of the attractions in Arkansas’ most famous and oldest alligator farm located in Hot Springs just across from Whittington Park. Established in 1902 mostly to raise alligators for their hides and to sell them to zoos, the farm quickly developed into a tourist attraction popular among the many visitors to Hot Springs. The farm now has more than 300 gators and a petting zoo with emu, deer, pygmy goats, ponies, and sheep. The farm is also home to a number of primates, wild ducks, Arkansas mountain lions, turkeys, wolves, peacocks, and many others. The farm briefly became nationally famous in 1918 when Babe Ruth threw a home run during spring training in Whittington Park just across the road from the farm. The ball landed in one of the alligator’s ponds and was never seen again. 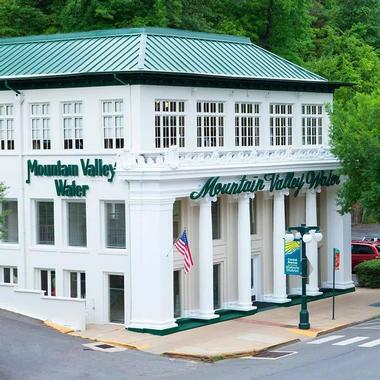 Mountain Valley Spring Water is a popular brand of spring water that has been bottled in Hot Springs at the same natural spring source since 1871. 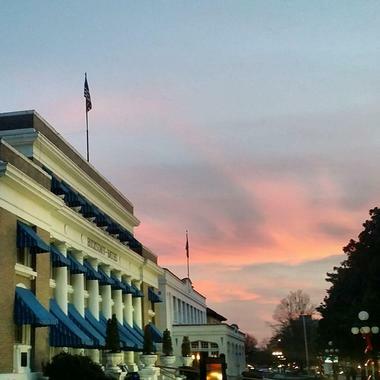 The company’s Visitors’ Center is located in downtown Hot Springs in a beautiful, elegant 1910 Classical Revival building that was originally built for DeSoto Springs Company and meticulously renovated in 2004. The building, also serving as a museum, is a great place where visitors can learn about the history of this company so closely linked to the history of Hot Springs. If you want to visit its bottling facility, join a tour and learn more about the establishment, which is located only 20 minutes from downtown. The Ouachita National Forest consists of 1,784,457 acres of forest located in western Arkansas and eastern Oklahoma. 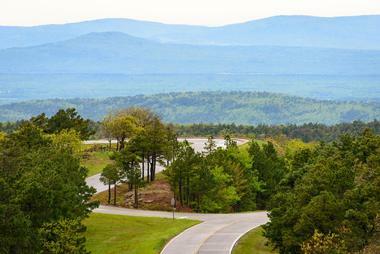 It includes almost all of the scenic Ouachita Mountains. These woodlands were never logged and today contain almost 800,000 acres of old growth forest. This amazingly dense forest has a number of scenic hiking, biking, and horseback riding trails. The Charlton Recreation Area is located deep in the forest between Crystal Springs and Mount Ida just north of Route 270. There is a campground and facilities for fishing and swimming on Walnut Creek. There is also a small artificial lake formed in 1938 by the damming of the creek. The 100 foot long stone Charlton Dam and Spillway and the nearby stone Charlton Bathhouse are listed on the National Register of Historic Places. 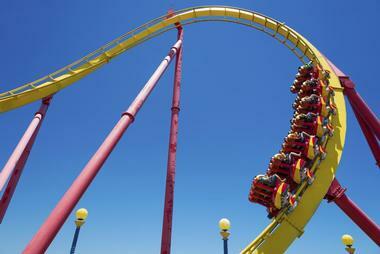 There is no lack of amusement opportunities for families in Hot Springs. Magic Springs and Crystal Falls offer two kinds of fun for the price of one – there are more than eighty attractions such as Arkansas Twister at Magic Springs and fun on the water at Crystal Lagoon, with three body slides, four tube slides, Crystal Falls Wave Pool, Kodiak Lazy River, and many others. Garvan Woodland Gardens, a botanical garden complex belonging to the University of Arkansas and located inside Hot Springs National Park, is composed of over fifteen separate natural areas and picturesque sites of interest. Fordyce Bathhouse, which was a working public bathing facility from 1915 to 1962, is now home to the visitor center for Hot Springs National Park. Guests at the park can take a tour of the Fordyce bathhouse to learn about the bathing routines of the past. The bathhouse has been fully restored to its historical heyday, reminding visitors of the roaring 20s and 30s. Its elegant first floor is covered in marble and stained glass, while the second and third floors are home to the men’s baths and dressing rooms and the music room, respectively. Surprisingly, this bathhouse even had a bowling alley during its operational tenure, completing the recreational bathing experience. Lake Ouachita is the largest lake contained fully within the state of Arkansas with an area coming in at over 40,000 acres. 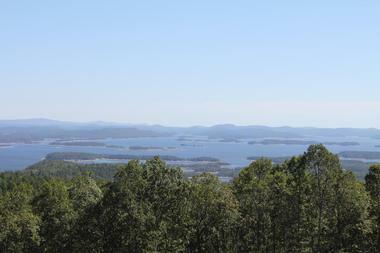 Lake Ouachita has almost unearthly clear water and is a favorite spot for watersports enthusiasts and anglers. Many love to sail, swim, scuba dive, or try their luck at catching catfish and striped and largemouth bass here. The lake even has a set of three natural springs, the Three Sisters Springs, which lies on the shoreline to the east of the Lake Ouachita State Park visitor center. Each of these three natural water sources, now a historical site, is said to cure a different ailment. 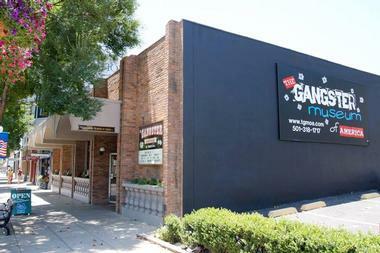 The Maxwell Blade Theatre of Magic and Comedy is a cozy space where guests of Hot Springs can come to enjoy live evening and afternoon shows by master illusionist Maxwell Blade. 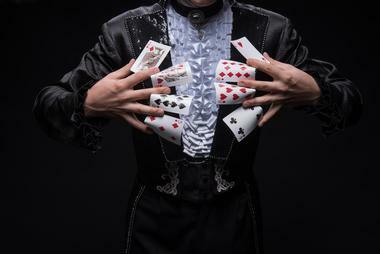 Maxwell Blade is a lifelong musician and magician whose family-friendly performances wow and delight the audiences that come to his intimate theater. Blade interacts with the spectators, drawing them into the humor and magic of his act. And the theater’s Oddity and Curiosity Museum, with its 300-plus exhibits from all around the world, only adds to the fun. The theater is conveniently located in the heart of Hot Springs’ historic downtown. Bathhouse Row is a sight unique to Hot Springs Natural Park and a National Historic Landmark as of 1987. 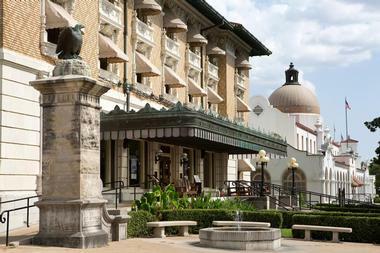 The “row” is composed of three features: eight historic bathhouses that are fed from the natural hot springs of the park, the so-called Grand Promenade walkway running behind the bathhouses, and a Spanish Mission-style park administrative building. 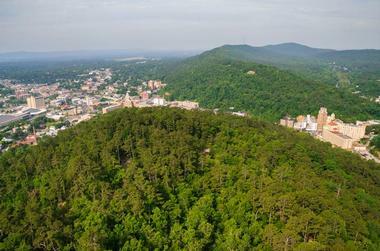 Hot Springs Mountain is a favorite spot among tourists because of the breathtaking views it offers of the national park and the city of Hot Springs. The mountain is accessible to hikers, who can begin their journey on the Mountain Trail at the picnic shelter located below the Hot Springs Mountain Tower. From here, the path leads through a picturesque pine and hardwood forest up to the top of the mountain peak. Because this walking trail can be quite steep at its start, some prefer to drive their cars up the winding mountain road to reach the summit. There is a good reason why more than 200 couples every year chose Anthony Chapel for their wedding. This magical six-story-tall building made of enormous yellow-pine beams and columns has floor-to-ceiling walls made of glass and many skylights that allow for views of the verdant surrounding trees in, creating the ambience of a fairytale forest. 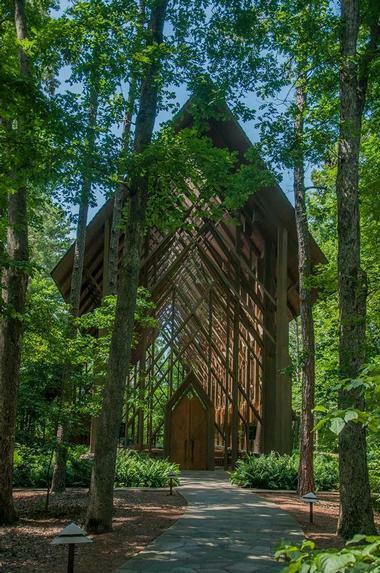 The chapel is located at the Garvan Woodland Gardens at the University of Arkansas in Hot Springs on top of the hill overlooking Lake Hamilton. It is the brainchild of architects David McKee and Maurice Jennings, both alumni of the U of A’s. They created everything, from the system of open-beam bracing to the wall sconces, pews, and outdoor lighting fixtures. The chapel can seat 160 people and is used not only for the weddings but also for concerts, christenings, and memorial services. The Hot Springs Mountain Tower is the most convenient way to enjoy great views of Hot Springs National Park and the Ouachita Mountains. The tower has an elevator that transports groups upward to a height of 216 feet, where visitors can then venture out onto observation decks. The decks soar above the forest, looking out onto vistas of gorgeous scenery all around. From this altitude 1,256 feet above sea level, Hot Springs Mountain and the Diamond Lakes become visible. The tower has a gift shop on its ground floor, which has a selection of souvenir items and to-go snacks for purchase. Lake Catherine State Park is located several miles outside Hot Springs at Lake Catherine, one of Arkansas’ so-called Diamond Lakes. The park is outfitted for recreation, with a visitor center, four hiking trails, playgrounds, picnic areas, and a marina where fuel and bait are sold. 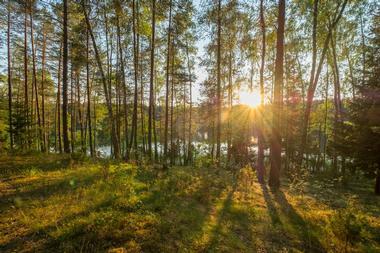 As for accommodations within the park, twenty cabins are located along the shore of the lake, and the land has a dedicated campground with seventy sites. Guests of the park can explore on their own or take advantage of guided tours and educational programs led by park employees. When weather permits, accompanied horseback riding tours are available along the trails. If you brought the kids to Hot Springs and they have had enough of mineral pools, take them to burn off some energy at Funtrackers Family Park. To start with, they have the largest and the fastest pro style drift go kart track in town. Then they have the Wet & Wild Bumper Boats, perfect for bumping and splashing around while dueling with friends using the squirt-guns each boat comes with. There are also more than fifty of the latest arcade games and a snack bar to replenish energy. Once you have recuperated, stroll to the Volcano Falls Miniature Golf – there are eighteen holes with giant waterfalls and an enormous volcano with fireballs that erupts 25 feet in the air. Hot Springs is located in a lovely valley surrounded by dense, lush old-growth forest. Imagine seeing the trees and animals living among them from high up in the air while strapped in a harness to one of twelve zip lines. Adventureworks Hot Springs is located only 40 minutes from Little Rock at Catherine’s Landing, a premier local outdoor lodging venue. You will literally fly through the air on a sturdy steel cable completely safe in your harness and experience this magnificent canopy world as the birds do. 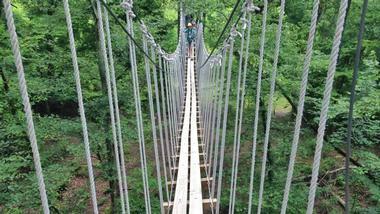 Besides ziplines, there is a sky bridge with an observation deck where you can spend some time enjoying the view. The whole adventure takes about two hours and is suitable for anyone over eight years of age and under 250 pounds. 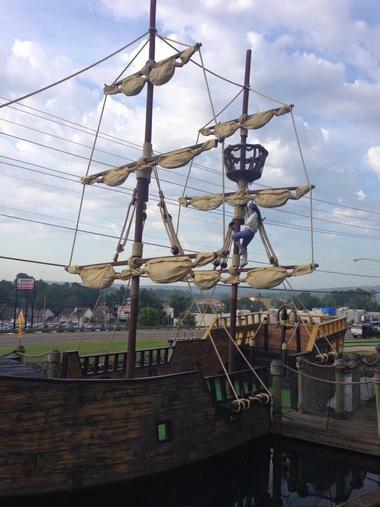 What is a full-size pirate ship doing in Hot Springs so far away from the sea, surrounded by the green Ouachita Mountains? 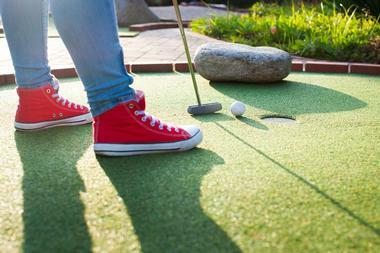 It is there to provide fun for kids big and small as a part of the challenging 18-hole Adventure Golf Course. Surrounded by waterfalls and dark caves, the ship offers a fantastic adventure as you make your way over footbridges, through caves, under the waterfalls, and between hammocks with sleeping pirates. There is a lot of water to splash around in, but instead of sandy beaches and rugged cliffs, the beautifully landscaped grounds of this extraordinary attraction, a pride of Hot Springs, surround you. 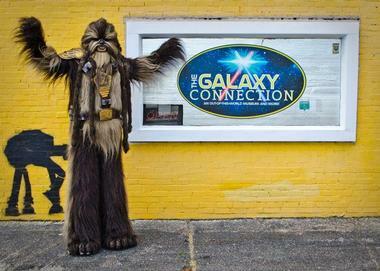 Whether you are a serious Star Wars fan and have seen every single movie several times and have a costume of your favorite character hidden in your closet or you just enjoy the occasional venture into the world of galaxy travelers, you will have great fun at the Galaxy Connection. Owner Jon Clowers spent a lifetime collecting props, toys, and even life-size Star Wars and superhero characters and is sharing them with visitors to his fun and unique Hot Springs museum. You can wonder through the crammed galleries on your own or enjoy the owner’s VIP tour. You can even dress up in your favorite character’s costume or at least take a lot of photos. There is also a great gift shop where you can find assorted Star Wars or superhero items not usually found in stores.